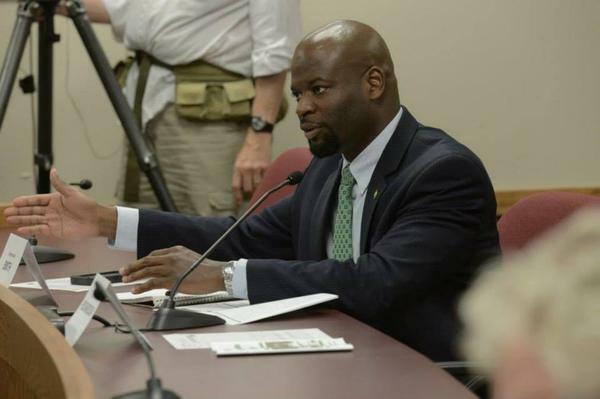 Rep. Clem Smith, D-Velda Village Hills, was elected as vice chairman of the Missouri Democratic Party last weekend. State Rep. Clem Smith was willing to step away from Missouri politics after being barred from running again for the House due to term limits. In one of his final speeches, Smith said he was “going to ride out into the sunset like Shane and get an AARP card so I can get discounts at Best Western or something.” But the four-term state lawmaker from St. Louis County kept getting encouragement to stay involved, which is one of the reasons he ran for and won the vice chairmanship of the Missouri Democratic Party last weekend. Smith was elected to the No. 2 spot in the Missouri Democratic Party over Darryl Gray, a civil rights activist who is running for St. Louis alderman. Jackson County Prosecutor Jean Peters Baker was elected chairwoman over two other opponents. The leadership change comes after U.S. Sen. Claire McCaskill lost re-election and Democrats failed to pick up any seats in the Missouri General Assembly. It also happens as the party got swamped in rural parts of the state, including places like northeast and southeast Missouri where Democrats are historically strong. Amid a debate about whether Missouri Democrats should focus on their base in urban and suburban Missouri or reach out to rural counties, Smith said the party can and must do both. Still, Smith believes that Congressmen Lacy Clay and Emanuel Cleaver both “have merit” in criticizing McCaskill for not putting enough emphasis on boosting black voter turnout. For her part, McCaskill pointed to how her vote totals in St. Louis, Kansas City and St. Louis County were up compared to previous elections. McCaskill’s imminent departure is also prompting questions about the party’s bench for key elections. Both Clay and Cleaver will be gaining power with the Democratic takeover the U.S. House, yet it’s unclear if they’ll try to exert more influence on the Missouri Democratic Party. Smith said that Clay, Cleaver and Galloway are going to be part of a “consortium of folks” who take the lead for Missouri Democrats. No prominent Democrats have officially announced a run for governor in 2020. In addition to Galloway, potential candidates include former Missouri Democratic Party Chairman Stephen Webber, state Sen. Scott Sifton, D-Affton, state Sen. Jill Schupp, D-Creve Coeur and Kansas City Mayor Sly James. Missouri Republicans are slated to elect leaders in late January. Missouri Republican Party Chairman Todd Graves announced that he will not be running for another term.